You’re moving out for the first time! To make sure you have everything you need for successful adult life, we’re here with the ultimate moving out for the first time checklist. “Adulting” doesn’t have to be difficult. With this checklist in hand, you’ll be on your own and thriving before you know it! Some items are just non-negotiables when it comes to adult life. To keep yourself healthy, financially sound, and thriving as an adult, make sure you cross all these items off your moving out for the first time checklist. Budgeting may be one of the most intimidating parts of adult life. However, in order to keep a roof over your head and food in your refrigerator, you’re going to need to start budgeting. Your budget doesn’t have to be a complicated spreadsheet with dozens of columns and formulas, but you should keep track of recurring monthly payments, grocery purchases, and other non-negotiable budget items. Once you know you can cover those bills, you’ll know what your discretionary income is and you’ll feel more comfortable splurging on a nice meal or new pair of shoes. The most important principle of budgeting is to make sure you live within your means. Though you don’t necessarily need to budget for everything you purchase, you should track your spending to make sure you never spend more than you make. If it’s a challenge for you, try using a financial planning or budgeting app. Budgeting might be intimidating now, but in thirty years, you’ll be grateful for the financial diligence you did in your younger years. Once you’ve succeeded at living within your means, add a credit to your moving out for the first time checklist. Your credit score has a big impact on your quality life, from what kind of apartment you can get to what kind of car you’ll be able to drive. If you’ve never had one, try starting with a secured credit card to help keep your spending under control, and make payments on time. Missing a payment by even a day can have a negative impact on your credit score. If you have a car or student loan payment due monthly, paying that on time will also help build your credit score. Check your credit score yearly through a credit monitoring service and put effort into building your score. Also, if you ever notice that your credit score is calculated wrong — for example, if your credit report states that you missed a payment that you’re certain you made — make sure to report it. A bad credit score can negatively impact your life, so stay aware of where you stand. Trust us, you don’t want to ignore this moving out for the first time checklist item. You may think you’re invincible now, but if you catch the flu or break a bone, you’re going to need a health insurance policy to help pay the bills. The average cost of an emergency room visit is $1,233, and going to an urgent care facility without insurance can cost as much as $150 per visit — not to mention the price of any needed prescriptions. If you’re under 26 and live in the United States, you can stay on your parent’s health plan — hooray! However, if they don’t have insurance or you’re over 26, you still have options. Check with your employer and look into affordable federal health insurance options. Also, some states have state-specific healthcare marketplaces, in which case you won’t need to go through the federal government to get insurance. 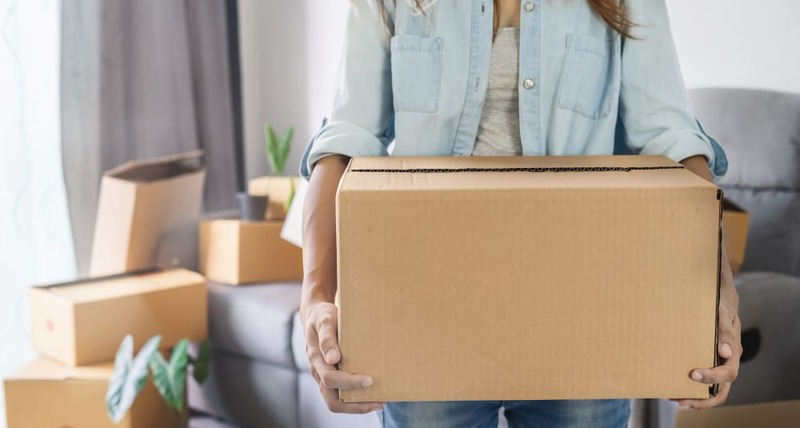 Now that you’re moving out for the first time, you probably have some prized belongings, whether a flat screen TV or expensive jewelry from your significant other. If an unfortunate event causes loss or damage to your items, you probably don’t want to bear the cost of replacing them alone. If you want to protect those items and get compensation when unfortunate events happen, add renters insurance to your moving out for the first time checklist. Policies typically have low monthly payments and many offer full replacement coverage — which means if someone breaks into your home and steals your TV, you can replace it at no cost to you. Just be sure to compare different policies to find the best plan for your needs. If you’re reading this moving out for the first time checklist and you still regularly go to your childhood pediatrician, it’s time to find a new primary care doctor. If you’re moving away from your hometown, you’ll also need to find a new dentist, eye doctor, and any other medical professional relevant to your health needs. It’s also a good idea to find a reliable urgent care facility for minor health problems like a sprained ankle or seasonal allergies. Don’t settle on the first doctor you meet. Instead, visit several different practices and ask questions about the doctor’s experience and who you will see if they are unavailable. If you have no idea where to begin, ask your former doctor, friends, and family for recommendations. Just make sure the doctor you decide on will accept your health insurance. If you’re over 21, you won’t want to forget this moving out for the first time checklist item. If your driver's license (or ID card) was issued before your 21st birthday, it might have big red letters on it with the words “under 21.” Moving out for the first time is the perfect time to have those words removed by renewing your license. Don’t forget to provide the DMV with your new address, too! If you’re moving to a new state, you need to know how to update your driver’s license and registration. Visiting the DMV may not be how you want to spend a Monday morning, but trust us, the sooner you take care of this moving out for the first time checklist item, the better! Your mom and dad probably won’t want to be the ones to move you out, so you’re going to need to add a moving company to your moving out for the first time checklist. Hiring a moving company for the first time can seem overwhelming, but you won’t regret the extra help on moving day. Ask the right questions and avoid moving scams, and you’ll be settling into your own home in no time. Moving out for the first time means decorating your own apartment for the first time. However, before you bring out the Christmas lights, you’re going to need to check the basics off your moving out for the first time checklist. The upfront costs of an apartment can be staggering, leaving a tight budget for furniture. To help save money, ask your parents if they have any old pieces they’d be willing to give you. If you have roommates, consider splitting the price of other items with them. Your first apartment checklist should include essentials like a couch, dishes, and a really great mattress. You probably won’t be able to buy everything you want right away, so think about what’s important to you and invest in those apartment essentials first. Even if you’re not moving to a new city, moving out for the first time means you’re going to need some new community connections. Living on your own requires building a support network outside of your family. That means finding community will be a very important to-do on your moving out for the first time checklist. Where to begin, though? Thanks to the internet, finding new friends doesn’t have to be that difficult! Try joining a group on Meetup or using an app that’s specifically for meeting new friends — online connections aren’t just for dating! You can also spark new friendships by asking a coworker to grab a drink, going to a workout class consistently, or striking up a conversation with your neighbors. With a little bit of proactive effort, you’ll find your “squad” in no time. Becoming an adult means you get to add some nice-to-haves to your moving out for the first time checklist. 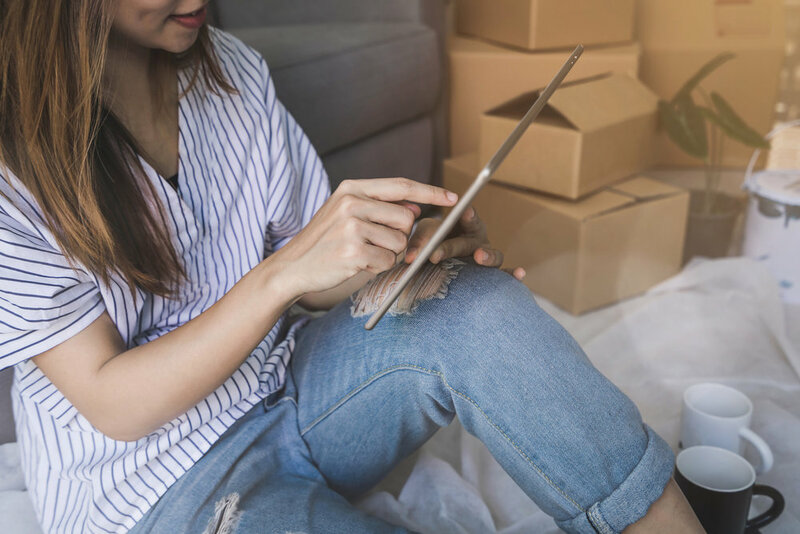 Whether you’ve always dreamed of decorating your living room with hilarious photos from college or you just want to make sure your subscription to People gets to delivered to your new home, don’t forget to cross these items off your moving out for the first time checklist. Moving out for the first time probably means you’ll be paying your own rent. If you want a nicer place but you can’t afford it, or you just want more of your income to go towards coffee, a roommate can be a great addition to your moving out for the first time checklist. You can find a roommate by reaching out to your college friends, posting in apartment-hunting Facebook groups relevant to your city, or downloading an app. Get creative! If you’re ready to diversify your diet beyond instant ramen, you’re going to want to add a meal service to your moving out for the first time checklist. If you’re just starting out in adult life, cooking for yourself can be a challenge. By using a meal service, you can save time and effort on meal planning, grocery shopping, and finding recipes. Plus, you’ll learn what kind of meals you enjoy. Before you know it, you’ll be an expert chef! Now that you’re heading into adult life, you may want to buy toilet paper, paper towels, and other necessities in bulk. In the long run, bulk purchases on items you buy repeatedly can save you a lot of money. Items like batteries, cereal, and paper goods are all deeply discounted at warehouse clubs. Whether it’s Sam’s, BJ’s, or Costco, these stores also typically offer perks like delicious fresh food, discounts on services like insurance, and good return policies. Plus, a warehouse club is a one-stop-shop for everything you need, saving time and providing convenience when you have a busy schedule. If there’s a club near your new apartment and you are interested in buying in bulk, it’s worth it to add a warehouse club membership to your moving out for the first time checklist. Have you always wanted to get your favorite magazines delivered to your door, but didn’t want to pay for it? If you’re moving out and into adult life, now is the time to add magazine subscriptions to your moving out for the first time checklist. Though magazines like GQ or Vogue can be fun, consider having industry-relevant, news, and business magazines delivered to your door, too. Reading a wide variety of magazines can give you new perspectives on your life and work, and increase your knowledge of important topics. You’ll be feeling like a real adult in no time. You’re moving out for the first time, which means you’re becoming an adult, which means you should probably start learning to take care of something other than yourself. You might not be ready to commit to a dog, cat, or goldfish, but a plant is an easy item to add to your moving out for the first time checklist. We suggest choosing a houseplant that’s easy to keep alive. If you’re successful with that, then upgrade to a plant that requires a bit more attention, and eventually, you’ll feel confident enough to take care of a pet. Houseplants may make your apartment feel like home, but we know you’ve been dying to add decor to your moving out for the first time checklist. Make your place feel like yours by searching for inspiration in magazines and online. Go ahead, get creative with your space. Just don’t forget about your budget while you’re shopping. As excited as you are to be moving out, this probably isn’t the best time to put a $1,000 coffee table on your moving out for the first time checklist. Focus your decor search in clearance aisles and thrift stores, and you’ll be grateful when you have extra money for vacation (or coffee!) in a few weeks. Remember, you can make your space homey with cheap printed photos, inexpensive wall hangings, and simple Christmas lights. The most important thing is to simply take the time to make your space feel like home. Being an adult means you have to start taking care of yourself. However you want to do it, you need to make sure you’re staying active as a way to manage the stress of adult life and stay healthy. Check out the gym options near your new apartment or workplace and check if your employer offers any wellness perks, like discounted memberships. If gyms aren’t your scene, you could also try adding a fitness class to your moving out for the first time checklist. Check out what’s being offered in your area and take advantage of free membership trials. Whether it’s karate or yoga, becoming a regular class attendee can be a great way to stay healthy and meet new friends while you’re at it. Even if you can’t see yourself checking out a new book each week, your local library is a valuable resource. When your Wi-Fi has problems or your air conditioner dies, you may want a place to sit that doesn’t require you to buy a coffee. Plus in some cities, library cards can get you discounted access to cultural attractions like museums. No matter how you use it, a library card is a helpful, free tool that you won’t regret adding to your moving out for the first time checklist. No matter what your job situation is, you should have at least one quality interview outfit on your moving out for the first time checklist. This could be a power suit and a really great pair of shoes or an outfit that just makes you feel amazing. Most importantly, this outfit should be professional and appropriate for situations like job interviews. A moving out for the first time checklist might seem overwhelming, but with a little planning, you’ll be fully equipped for adult life. With your first apartment, credit card, and power suit, you’re going to be ready to take on the world. Good luck!